The bathroom is home to many items, including soaps, shampoo, towels, hairbrushes, and much more. It is easy to leave some of these items sprawled out on the counter, but this makes your bathroom look dirty and disorganized. Our residential cleaners will pick up and organize these items, keeping your bathroom looking as tidy as possible. This is a great option before a special event or just during your regular cleaning! A shower can be where you start your day or provide the perfect place to relax at the end of it. But with daily use, it is important to keep your shower and tub area clean both for comfort and safety. You will not have to worry about cleaning this bathroom feature when you hire our maid service! We can come to your home and scrub the shower and tub, ensuring that each member of the family can enjoy their own personal spa. Toilets and sinks are two of the most commonly used features in any bathroom. Unfortunately, this also means they are two of the dirtiest features in this space. Nobody wants to spend their free time scrubbing toilets and sinks, which is why it is a good idea to hire professionals! 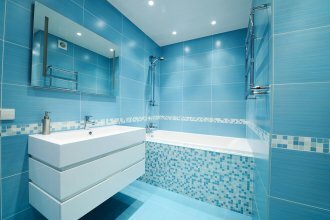 Residential cleaners can take care of these jobs, letting you enjoy a cleaner and healthier bathroom space. Flooring plays an important role in your home décor, even in the bathroom. Clean bathroom floors will look great and keep you feeling great when you step out after a shower. Our maid service is a great option for keeping floors clean without having to worry about vacuuming or mopping on your own.